We want to show prints! Therefore I commissioned 30 fellow artists to make large prints, without a set theme. 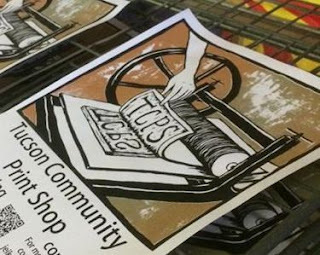 Printmakers from Tucson, El Paso (including Juarez and Las Cruces), and Albuquerque -- three points inside the hottest, driest stretch of flyover country. 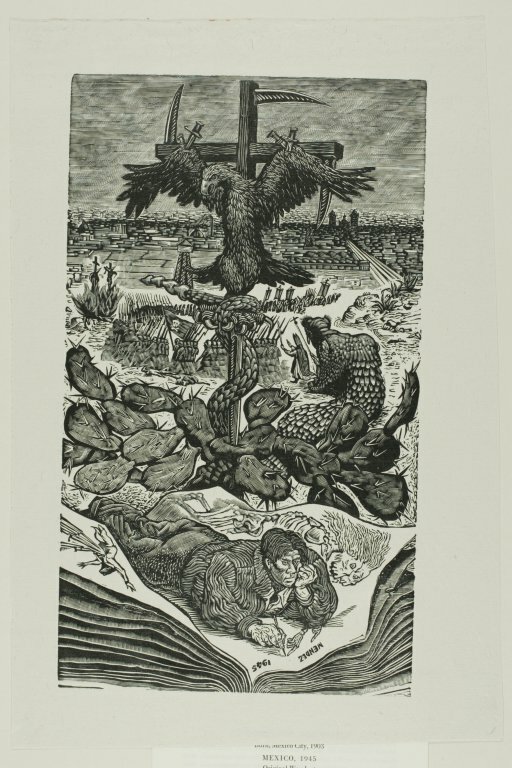 The main object of this carpeta (print collection) is to exhibit, both in and outside the Southwest, and remind the world that there is art in the desert. The Desert Triangle deserves a second look from art lovers. An artist does not have to live in San Francisco to be relevant. Four figure rents have driven artists from the big city, and repelled the younger generation. Yet millennials and adventurous types can still find relief between the Internet and mid-sized cities. Just the size of this carpeta makes a very contemporary statement, aside from whatever arid urban attitude that may surface in the collection. Our carpeta has revolved to face Mexico. Living near the border, our artists feel the tug southwards, as well as from the lateral influences of New York and California. 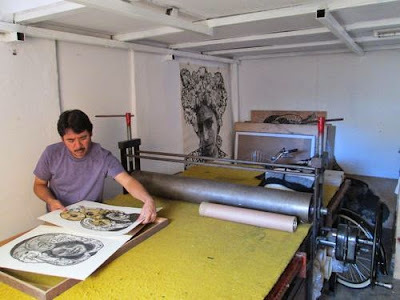 Many of our US printmakers have Mexican roots. We are very pleased that artists from two Juarez collectives accepted our invitation. 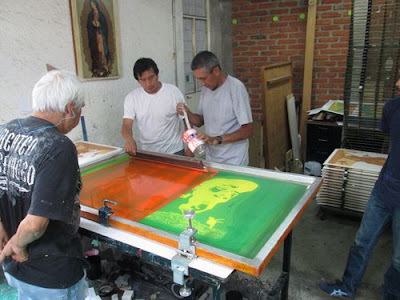 An unexpected perk was making many of our prints in Mexico City and Oaxaca. A third goal has evolved then -- to develop a more concrete exchange across the border. Perhaps new artistic themes will surface along this north/south axis. I insisted that each artist to print on a full sheet of cotton paper, 22 x 30 inches. Large prints can be seen across the room, making an architectural impact, to give our shows the weight of a painting exhibition. I asked for an edition of 50 prints, of which the artist kept 25. We are planning several exhibitions from the remaining 25, some simultaneously, because the main goal of the Desert Triangle Print Carpeta is -- to show prints! Obviously we did not include all the printmakers living in the Desert Triangle. I chose those who were not working completely abstractly, and mostly those that I had worked with before. What was supposed to be group of ten however, quickly blossomed into a force of 30 artists, which is really more than I can afford. However we hope that other Southwestern artists will also make prints, and would love to show with them in the future. While we do not have the resources to ship paintings or sculptures for exhibition in the next city (we did put on the Tucson Sculpture Festival in 2013, 2014, 2015), we can afford to volley prints. We can drive prints from Tucson to Albuquerque and have a pop-up show that evening. We can send prints to Mexico and show in one of the biggest cities in the world; and bring prints back to show in El Paso. Thus fine art prints are ideal for stimulating artists across the vast stretches of the Desert Triangle and reaching far away lands. I have always admired the silk screened posters of the 60s (in particular, those of Victor Moscoso), and was amazed by the Eastern European prints (such as those by Mieczyslaw Gorowski) when I discovered them later in life. Ultimately however, large, colorful Chicano prints were the biggest inspiration for our print carpeta. I personally learned silk-screening at the Mission Cultural Center for Latino Arts in San Francisco, by watching Michael Roman. After launching the carpeta, we discovered that some of our artists had made prints at Self Help Graphics, and Modern Multiples in Los Angeles (still going strong after founder Richard Durado passed away last year). 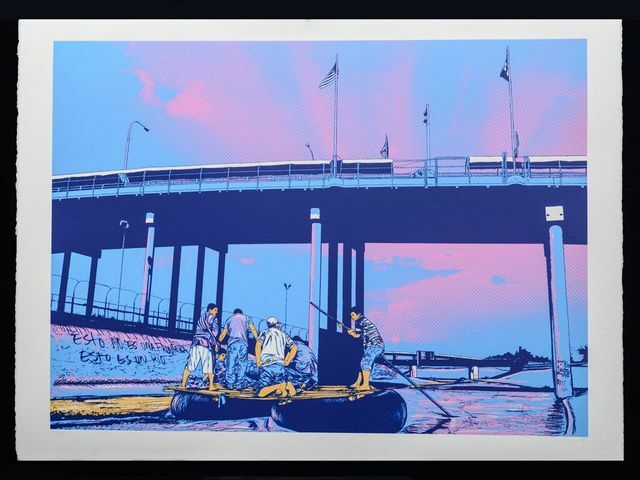 Others had silk screened with the Serie Project, at Coronado Studios in Austin (unfortunately founder Sam Coronado passed away in 2013). As a few of our Mexican-American printmakers had already enjoyed some support, we followed their lead. Last spring we drove out to Los Angeles Community College to see the big show -- Estampas de la Raza: Contemporary Mexican American Prints from the Romo Collection -- of prints mostly made in the above mentioned studios. The catalog had impressed us so much that we aspire to model the Desert Triangle Print Carpeta after this collection. More recently, we were humbled by a Oaxacan carpeta organized by Irving Herrera -- Oaxaca Collective (Carpeta Nacional de Estampa en Mexico) -- which we discovered after our trip to Oaxaca last December. Fundamentally, I have always been impressed with the Taller de Grafica Popular. We were fortunate enough to catch the exhibition of the TGP and Leopoldo Mendez recently, while we were making prints in Mexico City. I am inspired to make more prints by the old Taller de Grafica Popular, the Chicano print movement, and the contemporary printmakers in Oaxaca and Mexico. I hope that we can answer those traditions, and make a small Southwestern print contribution on our own terms. The Desert Triangle Print Carpeta was conceived in El Paso during their 2014 Chalk the Block arts festival downtown, as the natural sequel to our previous print projects. We brought the YayBig Print Exchange from Tucson, to show next to Horned Toad Print Exchange from El Paso, in a pop-up gallery. 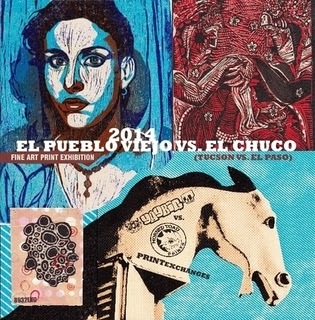 El Pueblo Viejo vs El Chuco. Meanwhile, the Maintain Art Collective was showing in a different pop-up gallery, a couple of blocks away. So we asked the Maintain curator Ramon Cardenas if he wanted to join forces with Tucson and Albuquerque, to make big prints for a contemporary Southwest project. As there were a lot of cross over artists showing in both of our pop-up galleries, this was a very natural development. Moreover each entity had exhibited prints at previous Chalk the Block festivals. The Maintain Collective had shown prints in 2011 and 2012. Likewise, we had shown prints at the 2013 Chalk the Block festival, as the YayBig Southwest pop-up gallery. Though our pop-up was an extension of Joe Marshall's YayBig gallery back in Tucson, we had already included a few El Paso prints in the collection. The Southwest print convergence had begun even before the Desert Triangle project was conceived. We were collecting prints that "want to get out of the printmaking studio," which tend to lean towards figurative subject matter. That criteria carried over into the Desert Triangle, as we selected most of our printmakers from those who participated in our previous projects. Ultimately some of the ex-members of the El Paso Collective "Contenido Neto" also joined our carpeta, as well as printmakers from the emerging Tucson Community Print Shop in Arizona. Our fundamental inspiration however, comes from Keith Allyn Spencer, and his commitment to exhibiting. For a low fee, he would hang work from any artist at his SpAG (Space Available Gallery) in El Paso, in a well kept dignified gallery, and faithfully kept the gallery open during regular business hours. That huge effort, from 2006 - 2008, buoyed up the El Paso art community, and can still be felt to this day. We are also inspired by Steve Eye, who allows any artist to exhibit at the Solar Culture Gallery in Tucson, no fees, no commissions taken. He changes the shows 3 times a year, which is a lot of work. By commissioning and showing the Desert Triangle Print Carpeta, we hope to perpetuate the convictions of both Keith and Steve -- Art has to be seen! Personally, I want to continue drawing. I need to find a more substantial medium to show off my figure drawing style, other than just pencil and paper. I want to continue creating art. However, I believe that showing and viewing art are critical to the process of making art. Therefore I want to contribute what I can, to support the whole creative process. I hope that we can continue making more prints, after going through this process and raising the platform. Karl, where to send pictures of 75 grados?